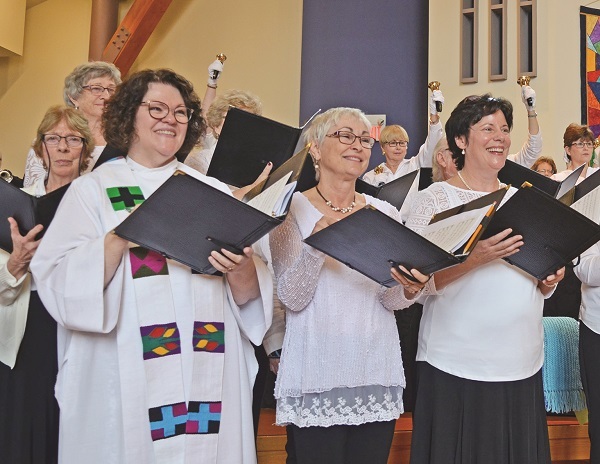 “This church has seen some days,” said Nora Sanders, General Secretary of the United Church of Canada’s General Council, to a packed house on Sunday morning as Aurora United Church officially marked its milestone 200th anniversary. A service filled with moving words, sounds from a team of musicians some 40-strong, and stories of service and partnership, it was one more momentous day in the storied history of the church, and shone as much of a light on the path forward as where they have been for the past two centuries. The 200th anniversary service took place at Trinity Anglican Church, which has been the spiritual centre of Aurora United Church since the devastating 2014 fire which destroyed their church building at Yonge and Tyler Street, a plot of land which, for the past two centuries, has been their spiritual home. At the start of the service, reminders of the church’s early foundations, as well as symbols of hope that rose from the ashes, were placed on the altar for all to see. Those practical elements were initially collected in a very practical way, in a simple gym bag, and, as Rev. Lorraine spoke, parishioners Nancy Kerswill, Lori North, and Holly Williamson conveyed the blue gym bag to the table, carefully unwrapping and placing each item in turn. “Every week thereafter, the communion table would be set in the centre here,” Rev. Lorraine continued. “The pulpit would be brought down from the altar and out of that bag would come the things we set our hearts on in this time: a cross, given to us by New Hope United Church; a Christ Candle, cobbled from our homes, base and handle alike; a yellow brick, recovered from our burnt church, a prayer shawl given to us from Newton Robinson United Church, wrapped around the cross every week as it wraps us all still in love; a hymn book representing the many given to us by our sister churches in our presbytery and beyond. There, at the Bicentennial Service, the past became the future, she said, and this was reflected in the messages and readings delivered to the vast congregation and dignitaries, including Ms. Sanders, Terry Davies, Chair of the Living Waters Presbytery, Mayor-Elect Tom Mrakas, and, representing Trinity Anglican Church, Minister Patrick White and Associate Minister Philip Josselyn-Hamilton. First among the guests to speak was Mr. Davies of Living Waters, who light-heartedly touched upon some of the heavier issues that AUC has had to address over the years, from cyclones knocking down spires to the latest fire. These sentiments were, in turn, reflected by Trinity. Appropriately, the plans for the new church and associated retirement home, were cleared just days before the service on October 22 by the Local Planning Appeal Tribunal. After a reading from the Book of Job, Ms. Sanders said there was much in the air to “stir the soul,” not the least of which are the stories of community and partnership that have come out of AUC’s last four years and its relationship with Trinity. Hardship plays a significant role in the story of Job, hardship which ultimately leads to salvation. In Ms. Sanders’ view, this is a journey also exemplified by Aurora United Church. “In the midst of hardship, look forward, have faith in the possibility of better days ahead, even when things are so bad it seems impossible that life will ever get better,” she continued. “Remember that God is faithful to us, even when we’re not given the answers we want. I know I am speaking to a congregation that knows something about that. I have a feeling that the people in this congregation, those who saw the church through cyclones, lightning, fires, that most recent fire, you people of this congregation knows something of this.